Now you can relive the IsliFe Innovation Forum, with the making-of video. This video showcases a special event where Tradecorp presented IsliFe 8.2, while providing an afternoon of unique experiences, such as the TradExperience, Virtual Reality, and round tables headed by experts. 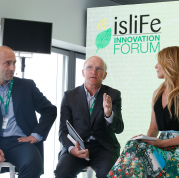 In July of this year, Tradecorp organized the Islife Innovation Forum in one of Madrid’s famous skyscrapers, Torre Espacio, located in the Cuatro Torres Business Area. Here, Tradecorp presented IsliFe 8.2, the first biodegradable iron chelate that is stable under alkalinity conditions. Thanks to its exclusive chelating agent, IsliFe 8.2 has a unique quality: innovative and gradual biodegradability, which combines biodegradability with high iron availability throughout the crop cycle. In addition to the product presentation, the forum was comprised of international experts whom represented large companies of the industry. They discussed the challenges facing the agri-food industry in three round tables. In the last round table, they discussed the role that innovation plays in agriculture. Attendees were also immersed in unique experiences that allowed them to deeply understand the products. The TradExperience entailed a live demonstration of the characteristics of this novel iron chelate, as well as its agronomic importance. On one hand, the Chemical Development team prepared several demonstrations that enabled attendees to verify the high solubility and efficacy of IsliFe 8.2, when compared with granules or powder products. They also introduced the concept of gradual biodegradability, a characteristic of IsliFe 8.2. On the other hand, the TradExperience’s second block focused on the agronomic factor. Tradecorp technicians explained iron chlorosis and the effect that iron deficiency has on the yield and quality of the crops. To showcase this, they used different crop species, which were developed in substrates that traditionally present problems when providing plants with iron. These crops included both woody and citrus species; apple trees, peach trees, vines, plums, quince and kiwi, as well as herbaceous species such as roses, strawberries and beans. The participants could then verify in situ, the difference between the clearly chlorotic state of the plants treated with non-efficient sources of iron, in comparison with the plants treated with IsliFe 8.2. They presented color and vigor typical of well-nourished crops, able to maximize performance and production. Tradecorp’s technical team used visual aids, such as graphs and diagrams, to explain the main factors that can lead to the development of iron chlorosis. They also explained what to do in order to avoid or correct it, as well as describing the scientific methods that demonstrate the effectiveness of Tradecorp’s products in agronomic trials that relate to the efficiency of IsliFe 8.2 as well as other iron chelates. Islife Innovation Forum attendees also immersed themselves in a Virtual Reality experience, “The route of liFe.” A 360º, stereoscopic and interactive journey, that allowed participants to understand first-hand; how soil pH affects the iron availability, the function that chelates fulfill in the prevention and correction of deficiencies, as well as the differences that exist between types of chelating agents. During this journey, users accompanied the iron through different stages, such as its root absorption, and when it is metabolized and fulfills its function in providing plant nutrition.